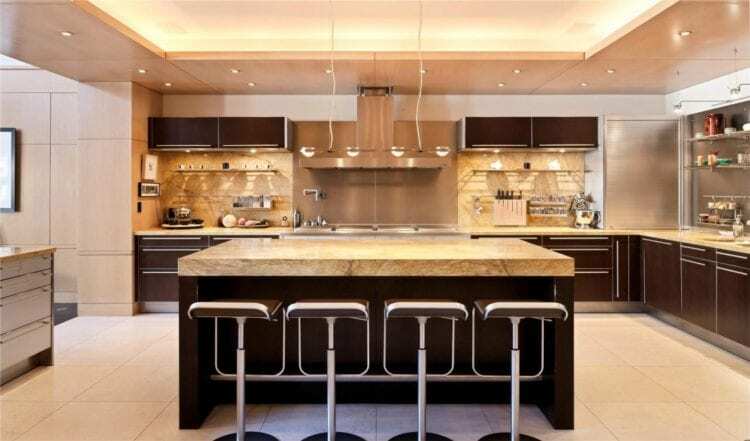 FeastHome – An Asian style kitchen can also be called as oriental kitchen design. 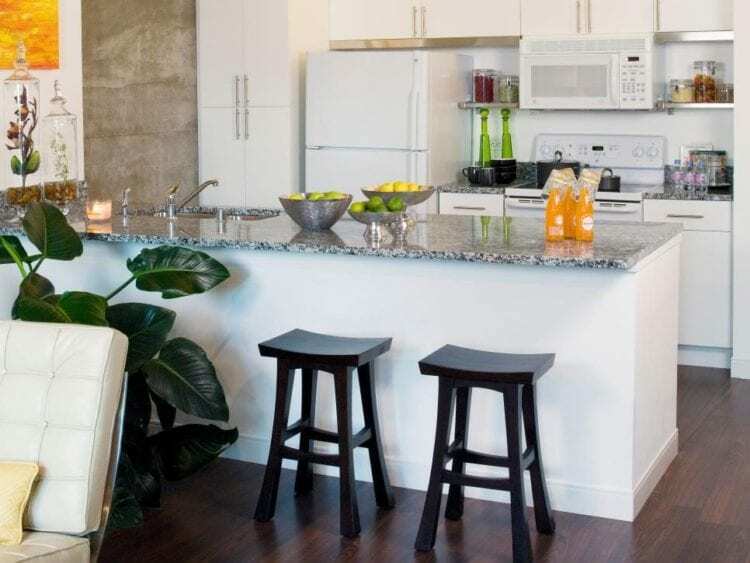 It’s the style that would offer a serene, peaceful, and Zen atmosphere around your kitchen. This type of style can also be described as a fusion of styles. The design elements of Asian style room are quite distinctive. You would easily recognize whenever you enter an Asian style room. If you want your kitchen to be filled with Zen from nature-inspired elements or sleek-styled furniture, Asian style is a perfect style. One thing you should notice first is the twin stools. It’s got an Asian-inspired design that plays really with the custom art elements and metal hardware. The design is unique and flexible. The walls are in a slate color which covers the natural side of this Asian kitchen. 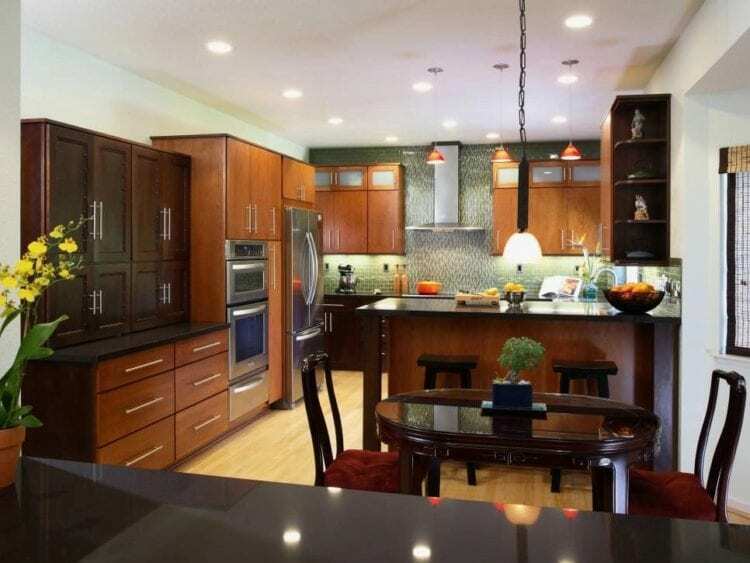 The dark brown color is chosen to be in this Asian style kitchen in order to create a sense of calm and comfortable. The traditional chair design is suited to the Asian theme of this kitchen. Take a look at the centerpiece of the kitchen island; it has a few natural elements in order to add a touch of Zen in this kitchen. As we know, Zen serenity is one of the Asian style characteristics. 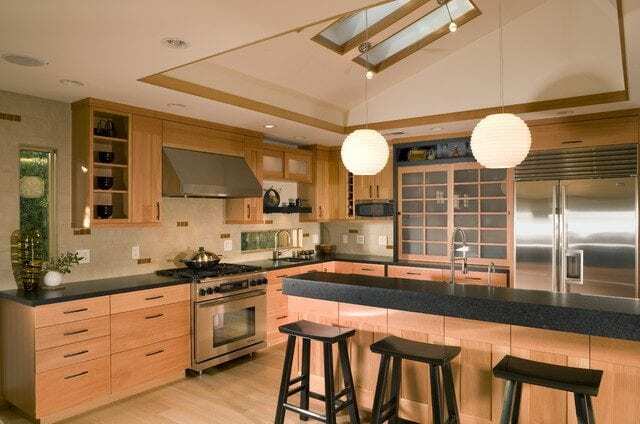 For you who want to level up the Asian style for your large and luxurious kitchen, this is the kitchen idea you want to take a look. It’s got a cabinet design full of texture which adds glamour to the scene. A centerpiece of any table has a high potential to be the biggest support of the room’s style. The centerpiece on the dinner table is the homeowner way to add more Zen into the kitchen atmosphere. That is quite a success. 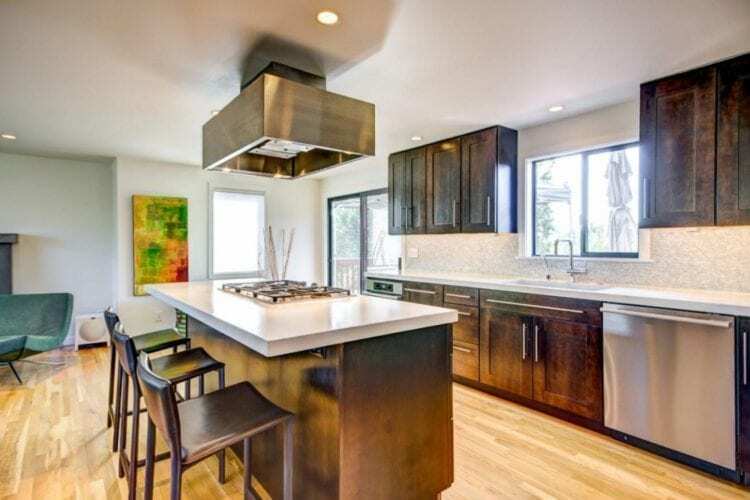 This modern kitchen is filled with dark teak wood. It’s on the floor, the cabinet, shelves, kitchen island, table, and decoration. 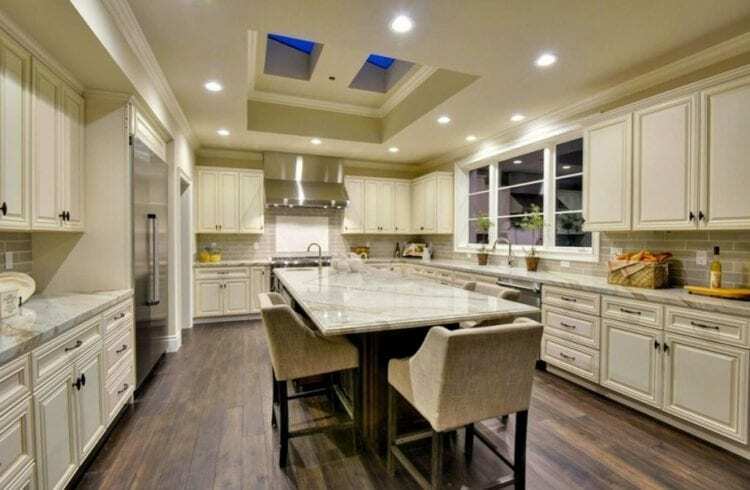 That’s why this kitchen needs a bright ceiling to light up the kitchen. It’s the fusion of Asian and industrial style kitchen. 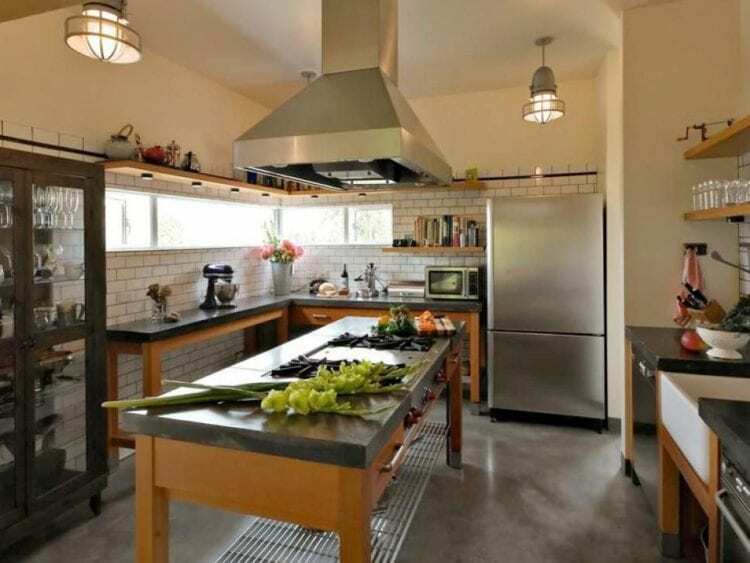 You can see that this kitchen is filled with the industrial element. 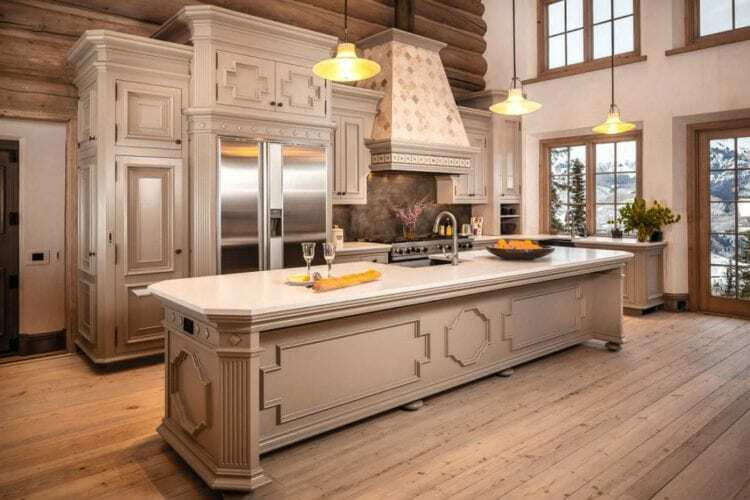 It’s packed with a wooden kitchen island with a steel countertop and built-in stove. There’s no better place to cook but on the kitchen island. The multipurpose furniture is typical an Asian style room. As you can see, the kitchen island is actually a repurposed table. The island is so functional that you can even cook on it. The color scheme of this kitchen is white. This basic color is painted all over the space of this kitchen except the floor. The flooring is using the natural light wood color which is matched with the three little stools. This cozy wooden kitchen is surely catching everybody’s attention. It’s mostly using natural wood as the material. It even has two wooden pillars that separate the kitchen with the other room besides. 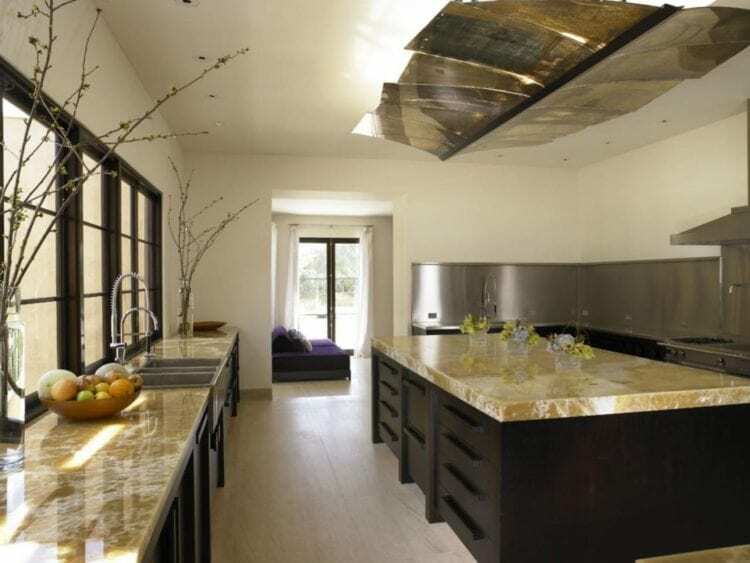 The Asian style is provided by the element of natural wood in this kitchen. That’s a typical Asian style which uses nature-inspired as the main interior theme. Once again, the dark teal wood element becomes the main attraction in the kitchen. 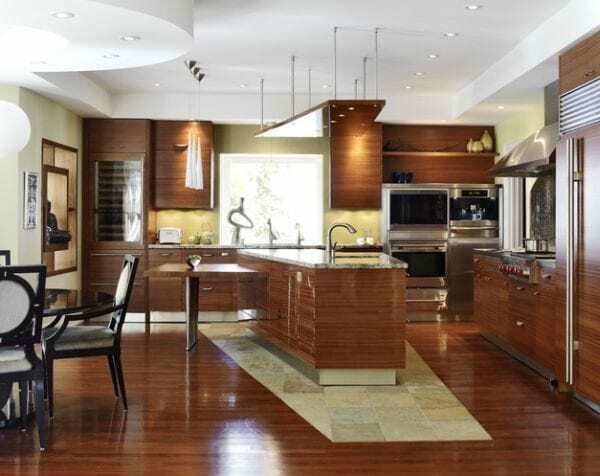 It seems like one popular characteristic of Asian style kitchen. The dark wood elements are everywhere except the flooring, wall, and ceiling. 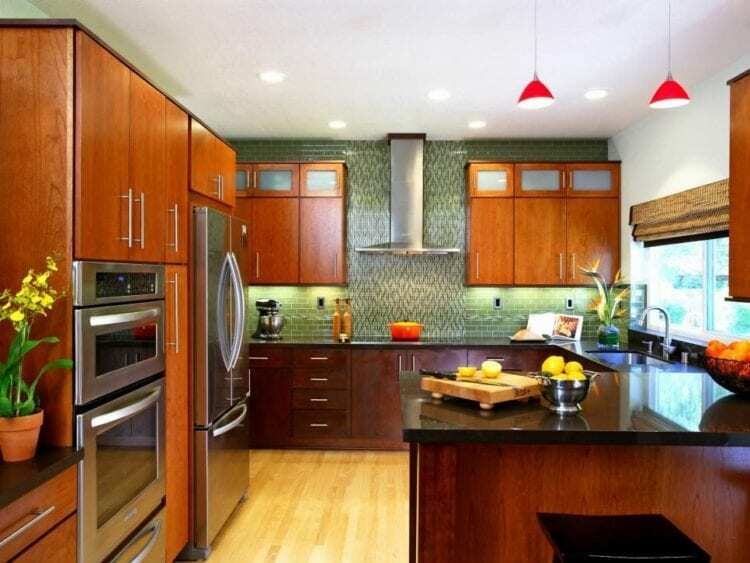 The green backsplash is intended to be the natural touch to support the concept. 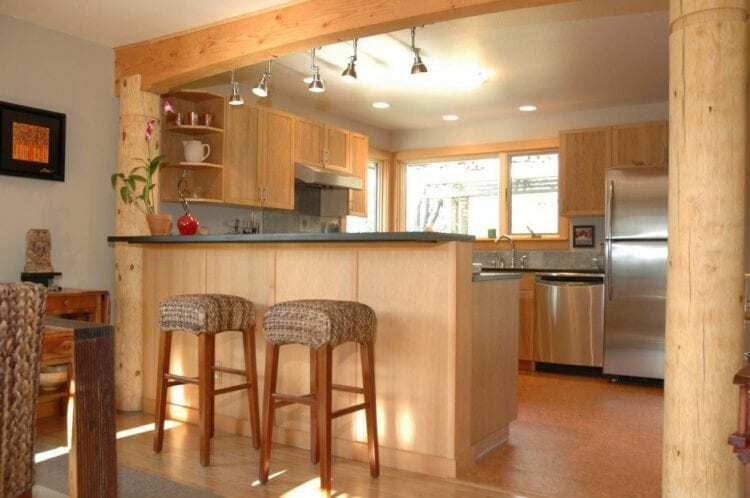 The nature-inspired element of this kitchen is that wooden structure below the countertop. It’s a nice way to add character to your kitchen. That wood accent is surely the main attraction of this kitchen. It’s attached with the black countertop to befriend the light wood. This family kitchen looks really comfortable. It has an open concept that’s accessible to the living room. It’s got four modern stools to accompany the kitchen island. From this view, you can see the cabinet design in front of you. That view is an Asian-inspired view. It’s got nice dramatic lights that emphasize the oriental texture of the space. 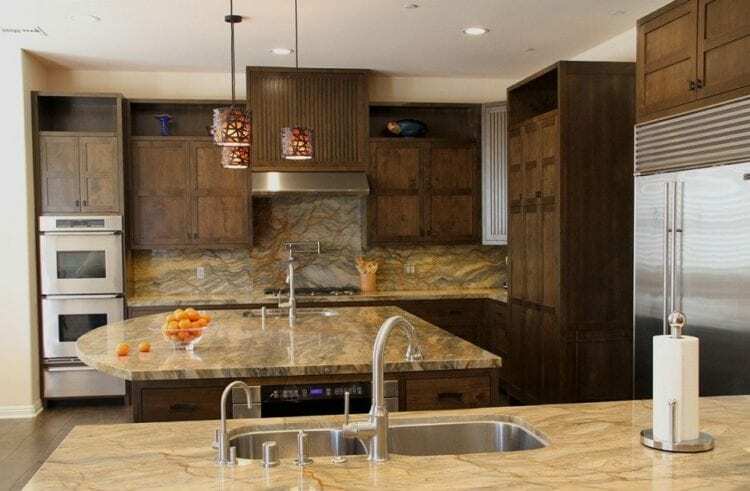 That dark wood cabinet has an old texture that strengthens the Asian charm of this kitchen. 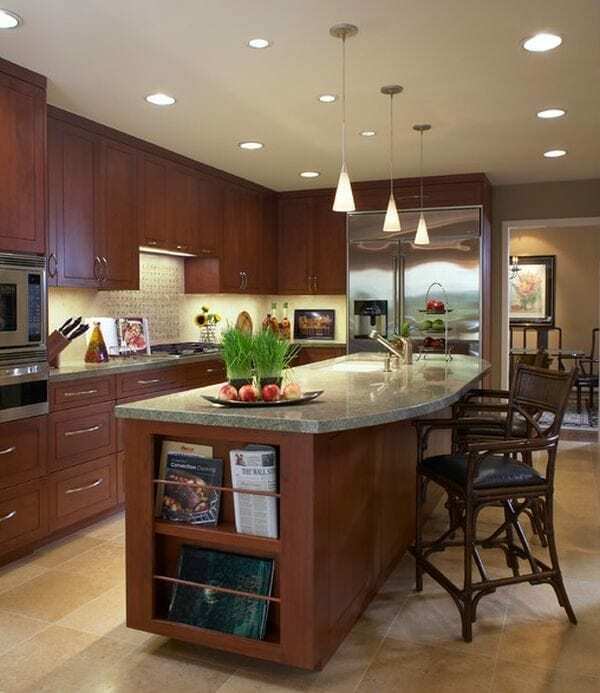 It’s supported by the granite backsplash and countertop which quite a match with the dark wood materials. This is a kitchen design from a house located in Japan. You can apply it to your house in order to experience the Japanese cuisine in an authentic surrounding. The choice of wood accent and colors should be well-considered. That black oriental stool matched with the black countertop which brings harmony to the design scheme. Having elegance in an Asian style kitchen design is so easy. Because the Asian style itself is already elegant and sleek. The open concept deserves to be in this kitchen. It’s very accessible. You’ll be easy to have efficient cooking. Zen could come from any element of the room. In this case, the Zen comes from the decoration. Those two gorgeous twigs stand on the counter beside the window to showcase the Zen that this kitchen needs. A U-shape kitchen is so friendly to people who love to get busy in the kitchen. In the middle of this kitchen, you can see a kitchen island slash dining table which fills the important spot of the kitchen. This kitchen has no window, but it has more elegance than other kitchens that have windows. 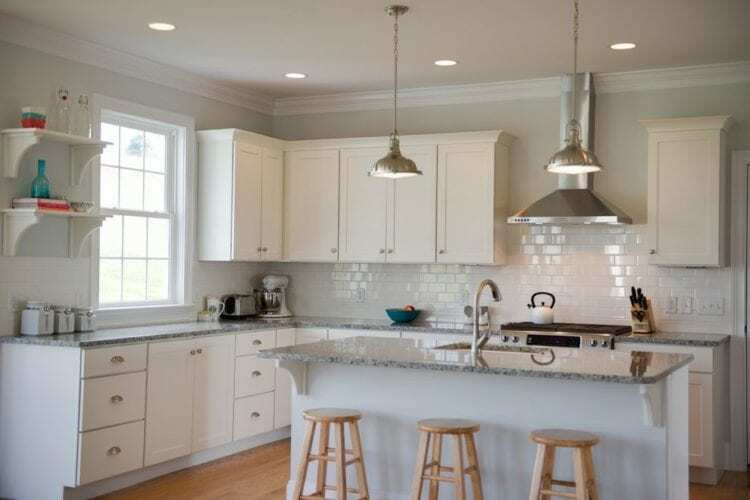 For some designers, windows don’t make a significant difference in the style of the kitchen. This kitchen uses the Asian-inspired stools and that oriental screen door on the back. 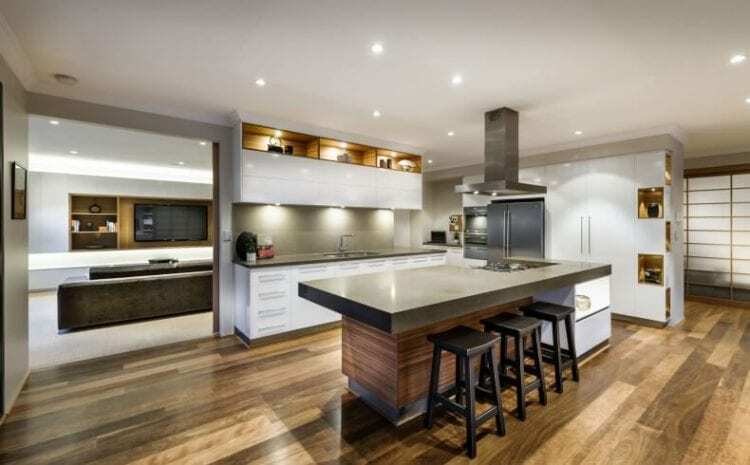 In order to achieve the Asian style kitchen, you don’t need to set a high level on a budget. You can just play with the material, color, and simple accessories that really associate with Asian style.